Until the beginning of the 1980s, the figure of Francois de Fossa was mainly known by his relationship with Dionisio Aguado, a relationship that included de Fossa’s collaboration in producing the two Parisian editions of the Aguado Escuela, and the complete translation of one of them into French. 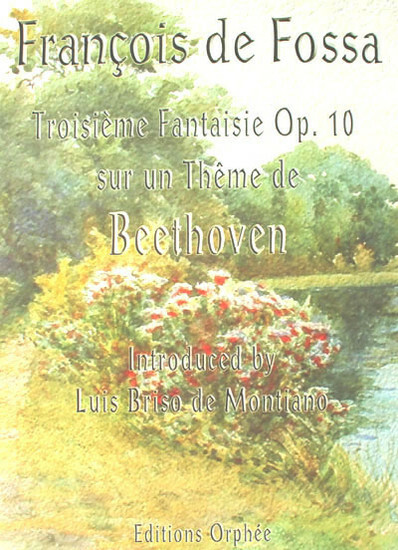 The situation changed radically in 1981 with the publication by Editions Orphee of a monograph which not only revealed very interesting and decisive factors in regard to the guitar quintets of Luigi Boccherini, but also included an important biographical study and a checklist of the known composition of Francois de Fossa. Several works by de Fossa were published in later years, among which were works for two guitars, trios, quartets, an anthology of selected works for guitar solo. While the part of the work of de Fossa that was known, and with the location of available source established, was being popularized and becoming the object of modern editions, sound recordings and concert performances, the missing and unknown parts of this ouvre was clearly conspicuous in its absence. A new and recent discovery of previously unknown works by de Fossa which reduces the size of the unknown part of his work, permits us to have access to a small part of his works, specifically his Op. 6, 10, 11 and 15, that have been preserved. The library of the "Jacinto Guerrero" conservatory of Toledo (Spain) contains a collection of nineteenth century printed editions of guitar music, by the most representative composers of the time. Several pieces in that collection, particularly works by Sor and de Fossa, include hand-written dedications by the composers to Dionisio Aguado. This detail permit us to conjecture that the collection comes from the personal library of Dionisio Aguado which, after a series of trials and tribulations, has survived until our days. The present edition is the first modern presentation of this newly discovered work.